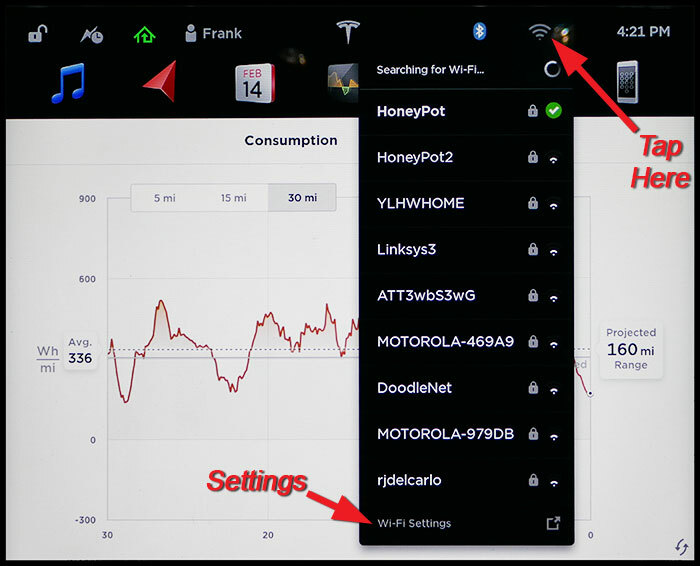 Our Tesla WiFi guide shows you the why and how of WiFi along with troubleshooting tips and tricks. On the Model 3, WiFi has not been activated (as of March-2018). It will be active in a future software update. Tesla recommends to connect to WiFi while at home if you have a network connection available. In some cases, updates through WiFi get priority over those Tesla sends over the cellular connection. You can also use WiFi to tether the vehicle to the internet through your phone. This can save you money after the 4 years of free cellular connection expires, or if you have a poor cellular connection in your normal travel area and have a better connection via your phone. 2.4 GHz WiFi (All Model 3 and S/X cars built after Feb-2018 have 5 GHz support as well). At the top of the main display, tap on the signal strength indicator. A list of available and previously set WiFi connections will appear. Tap the one you want and if never accessed before, enter the password for your WiFi router. It will remember the connection and automatically connect when in range. If you travel to another location and it has WiFi, you can use the same process to add additional connections. To add a new WiFi connection you can also go into settings and tap Add Network. When you add a network via the dialog, there are a few quirks to be aware of. After you enter the password and press “Enter” on the keyboard nothing will happen. You have to tap “CONNECT”. It usually takes about 30 seconds to validate and connect. If it fails, it usually does within about 1 minute. In either case, it doesn’t directly tell you if it succeeded or failed. If succeeded, the security and password and a button “FORGET NETWORK” will be grayed out and cannot be selected. If it failed, These options will be available and the “CONNECT” button also remains. You can then try another password. We’ve also identified a Tesla bug that if your password has a single quote symbol, the password will be rejected. This should be an allowable password character and we’ve laboriously confirmed all other symbols on a US keyboard work fine in a password. Most Tesla sales offices and service centers have free WiFi. It will connect automatically without needing any entry. If your vehicle is in for service and has an open service order, and the vehicle needs a new update, the update will be downloaded automatically while at service. 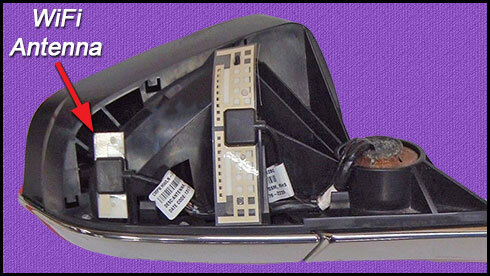 The vehicle’s WiFi antenna is in the right side mirror housing on both LHD and RHD vehicles. The best signal strength occurs with a minimum of walls and objects between the antenna and your WiFi router. The image below shows the mirror with the back removed. The smaller rectangular antenna on the left is the WiFi antenna. The larger antenna is for cellular. The vehicle’s WiFi hardware is located behind the main display. When a connection is made, Tesla uses a VPN (Virtual Private Network) with UDP (User Datagram Protocol). What this means is the data passed through the connection will be secure and low-latency. It also tolerant of lost or corrupted data packets to ensure reliable results. When the vehicle is connected via WiFi, at the top of the main display the five-bar cellular signal strength indicator changes to the WiFi icon with arcs for signal strength indication. Maps – Move the map to a new location or zoom out. The gray areas should fill in quickly. Music – Select Streaming and select a category to play. Confirm the music plays. Web – Select the browser and enter a site like Teslatap.com. The home page should display. We wrote a WiFi Meter app for Android phones and tablets. While we don’t think you need it (and it costs all of $0.99), it may be helpful to some. It gives you a far more precise indication of signal levels at different locations, a speed test and number of other WiFi details and help explaining what it all means. When the vehicle is using WiFi and you drive away outside its range, the vehicle automatically switches to the cellular connection. This switchover can take a few seconds, and if you’re listening to Streaming music, may force the next song to start playing, even if the prior one was not completed. It seems more transparent when switching from cellular to WiFi. If you can move the WiFi router closer to the vehicle, it should increase the signal strength. Often hard to do, so one of the other solutions may be required. If your router is more than a few years old and/or a bottom end cheap router, it likely performs poorly in general. Most routers that are provided by your Internet provider are also usually bottom end devices that will contribute to the problem. Look for a premium WiFi router that connects to your internet connection. Note that there are different connection types – DSL, cable modem or Ethernet to your internet equipment. See below for our recommendations. These devices are located halfway between the router and your Tesla. It picks up your WiFi signal and then re-transmits it – extending the range of your WiFi. The device only needs a power plug – no other wires are necessary, although most also provide one or more router ethernet ports. See below for our recommendations. You may get some improvement by just moving the vehicle. Position the vehicle so that the right side mirror is closer to your router. If WiFi had been working fine, but just stops working, try a reboot in the Tesla. Press in both scroll wheels for about 15 seconds, until the main display goes black. A reboot takes less than 60 seconds, but WiFi may take some additional time to get reestablished – less than 2 minutes. Go into the vehicle and select the antenna icon at the top of the display and go into WiFi. Remove your current connection, reconnect and enter the password. 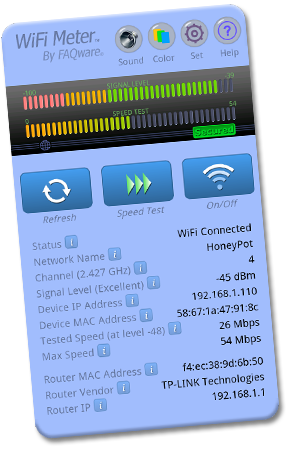 Most WiFi routers use 2.4 GHz or a mix of 2.4 and 5 GHz. If your router is set to only accept 5 GHz or perhaps a setting of “N only”, the vehicle will not connect. Change the router’s settings to allow 2.4 GHz. Newer high-end routers allow both 2.4 and 5 GHz communications at the same time, which may be beneficial for your situation. Model S and X built after February 2018 include hardware and software to support 5 GHz, as does all Model 3s. In the Controls, make sure Energy Savings option is set off. If on, it may not connect and/or may continuously connect and disconnect. One owner also needed to set the Tesla option Smart Preconditioning to On although others have not needed this option. On your router, check if the router is set to a congested or non-supported band. The Tesla hardware support bands 1-11, the standard in the USA. Some countries allow additional bands that Tesla cannot use, so if you’re outside the USA, be sure to use bands 1-11. Due to reduced interchannel interference, channels 1, 6 and 11 can often be a bit more reliable than other channels. On your router, confirm your WiFi is set up for WPA or better WPA2. If you are using the obsolete and insecure WEP standard, the vehicle will not connect. It will connect if you have no security, but we don’t recommend anyone leave a WiFi router set to No security. It’s not an issue for your vehicle, as all communications are encrypted. While most routers have no problems with VPNs, some may have an option to block/allow VPNs or it has a firewall that blocks a VPN. Check your router to see if there is a VPN blocking option and set it so it does not block VPNs. VPNs use port 1194. Some routers have a firewall that blocks everything other than ports 21, 80 and 443. Allow port 1194 as outgoing. Note this is not the PC’s firewall, which doesn’t matter. This is a setting within the router itself and does not affect the security of your network. Some routers have a short UDP timeout that can screw up Tesla updates and downloads. If you can find UDP timeouts (not all routers have this option), for Unreplied and Assured, set the values to 60 seconds. Most routers today offer a guest network option with a separate SSID WiFi Name. Some complex home systems that have a DLNA server in the network (even if wired), seem to cause connection problems with the Tesla and/or make the Tesla keep connecting and disconnecting. A guest network connection on a separate IP, without any DLNA servers, often makes it all work. MU-MIMO – allows multiple simultaneous communications on different channels. Especially desirable with 4K video and other devices on the WiFi network. Use an extender to provide more quality WiFi coverage in your house or garage. There are quite a few low cost extenders in the $30-50 range, but most lack power and/or feature that you may want for other devices in your house. All those below support dual band 2.4 GHz and 5 GHz, have one or more Ethernet ports, and support the standards – 802.11 a/b/g/n/ac. Click on the model for more details at Amazon. Cost is the street price as of Mar-2018 and may change. I read in another forum that on some routers, the default subnet can overlap with the Tesla’s internal network range. I changed the LAN on my (Australia) NBN router from 192.168.20.x -> 192.168.21.x and the WiFi connected. https://teslamotorsclub.com/tmc/threads/another-wifi-bad-actor-solved-wink-home-control.103293/#post-2439936 – ShockOnT (Post Dec 2, 2017). Thanks ShockOnT, this has been driving me crazy! Good info – hope it helps others! March 1 build, my model S has 5ghz WiFi enabled. Great to hear! 5 GHz is a new feature with the MCU2 unit shipping in new cars built after February 2018. 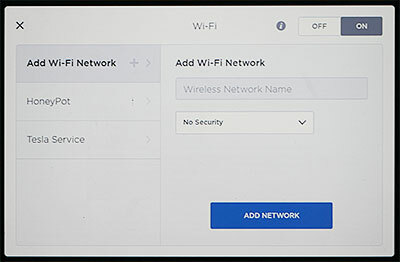 Should add having Wink anywhere on the network (Original Wink as well as Wink 2 connected by Wifi or ethernet) causes the Tesla Wifi to reinitialize. Even with my Teslas isolated on a Guest network and Wink on my primary it still causes the Tesla Wifi to re-initialize. Only completely disconnecting Wink fixes the issue. Thanks for sharing. My only suggestion is to check if there is updated software for the Wink. Sounds like they have problem that trips up the Tesla connection. There also could be a bug in Tesla’s WiFi, so perhaps a future Tesla update will improve it for you. After many tries I can still not get my 2017 Model X or 2017 Model S to remain connected to Wifi at my home. I have an Orbi router system and have the Teslas on their own Guest network with no other devices. They both connect for a period of time (up to 30 minutes) and then drop or renew the connection. I have tried everything at this point, not sure what the issue is. It turns out the issue was a compounding one. Wink conflicts with the Tesla WiFi in the same way DLNA servers do. This has been confirmed by many users. In addition the Orbi WiFi system does not completely segregate the Guest WiFi network so even if the Teslas are on the Orbi Guest Wifi, Wink still causes conflicts. The solution ended up being setting up a completely separate WiFi network with a separate router just for my Teslas. Thanks – it is sure to be helpful to others! You don’t mention using Summon over WiFi in your article. I cannot get it to work reliably, it keeps saying lost connection if it starts at all, even though streaming music and maps work well and I get several bars on the WiFi icon in my Tesla. I use a TP-Link Powerline Wi-Fi extender in my garage with the Powerline sender plugged into my router, because I found the range extender didn’t work well with my Tesla. With WiFi off the Summon is slightly better, but the mobile signal is very weak in the garage, so it is still not reliable. Any suggestions on getting Summon to work reliably over WiFi? My guess is there are too many delays in the data between your phone/WiFi/router/ISP and Tesla, and it sees the delays as a lost connection. Not sure what can be done to fix this. See the troubleshooting notes above. WiFi might be in N only, or 5 MHz only (neither will work with the Tesla). If you’re near a sales or service center, you can confirm WiFi works as it auto-connects at those locations. You never mention differences between LHD and RHD cars: for example, you say here that the antennae are in the passenger-side mirror and show the LH mirror – but, for RHD cars, are they still in the LH mirror or are they moved to the RH? It would help if you used the terms ‘left-hand’ and ‘right-hand’ rather than ‘driver’ and ‘passenger’. A fair issue. We don’t have access to RHD cars, so we don’t know if Tesla elected to swap item positions or keep them the same as LHD cars so we only report what we know. Generally you can assume all our talks are based on LHD cars. We estimate 98+% of all Teslas are LHD. Anyway, I can confirm that the antennae are in the RH mirror (passenger for LHD cars, driver for RHD), so it would be clearer to say that so as to cover the world. Something else that it would be useful to add: Tesla’s wifi supports only bands 1 – 11; I understand that these are the bands used in the USA but, in Europe (at least), we also use other bands and, if someone’s router is set to use one of those, the wifi won’t work. Thanks for the notes – I’ll update the text with this info! Thanks for adding those notes but you now say: The vehicle’s WiFi antenna is in the passenger side mirror housing on both LHD and RHD vehicles..
That is not so; as I said before, on RHD cars, it’s in the driver’s side (RH) mirror. Yep, I screwed that up! Now fixed. Thanks for the additional note. One bar may be fine. The signal indicator is not all that sensitive, but the real test is if it works well enough for streaming. If music streams fine (go through at least one song), your signal is fine and I wouldn’t worry about it. At some locations I get zero bars, yet the signal is still fast enough to handle maps, streaming, etc. as if it were on LTE.